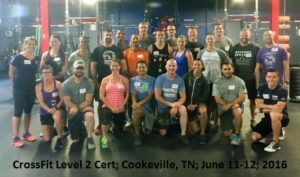 We had a great time this past weekend getting our CrossFit Level 2 Certification. CrossFit HQ does a fantastic job with their seminars. We learned a ton in a fun, supportive environment. Many thanks to our L2 training staff, James, Kristin, and Todd, and all our fellow attendees.